Seeing the late, great Muddy Waters in person was always a treat for fans. Seeing him live at Buddy Guy’s Checkerboard Lounge in Chicago was even better. An intimate venue, it served as the perfect environment for Waters’ songs. In November 1981, fans not only got to see Waters in this setting, some very special guests also joined him. Seems The Rolling Stones were in town in support of their album, Tattoo You and Mick Jagger, Keith Richards, Ronnie Wood and pianist Ian Stewart decided to take in the show. It didn’t take much persuading from their hero to join him on stage, making a memorable evening even better. 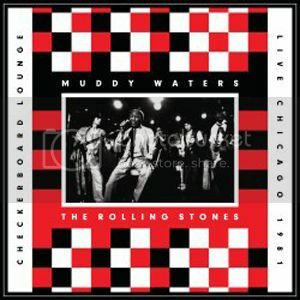 Fortunately, the cameras were rolling and the results make up the new DVD/LP set, Muddy Waters & The Rolling Stones: Live At The Checkerboard Lounge Chicago 1981. The show opens up with Waters’ band performing “Sweet Little Angel” and the up-tempo “Flip, Flop And Fly” as a prelude to the evening’s festivities. The band introduces Waters after their second number and that’s when the show’s real fun begins. A commanding presence, Waters leads the band through “You Don’t Have To Go,” which includes some fine harmonica work from George “Mojo” Buford and includes Waters on Telecaster. Waters delivers some blistering slide on “Country Boy,” showing his band – all fine musicians in their own right – how it’s done. The Stones walk in during a raucous “Baby Please Don’t Go,” taking their places at a vacant table near the stage. It wasn’t long, however, before Waters convinced them to join him in the performance. Jagger looks like a child on Christmas morning, so excited was he to be playing with one of his mentors. It’s rare, yet refreshing, to see an artist of his stature still get excited to see one of his heroes. Before long, Richards, Wood, Stewart and Guy all join in, among others, making for a once-in-a-lifetime performance. While this show has circulated as a bootleg for years, it has never appeared in this quality. It was never intended for public consumption, so there aren’t 100 camera angles, but it is quite good for what it is. Bob Clearmountain remixed the show’s audio with fantastic results. For this version, it also includes a 2-LP set of the show. While the CD version of this release was a single disc that only featured highlights of the show, the vinyl includes the complete performance. The discs are color coordinated to match the checkerboard pattern in the artwork as disc one is white and disc two is black. The albums are pressed on heavy-duty, high quality 180g vinyl and the gatefold sleeve is quite nice. This was to be Waters’ last performance with the Stones, as he died less than two years after this performance. Fortunately the cameras were rolling, making Muddy Waters & The Rolling Stones: Live At The Checkerboard Lounge Chicago 1981 a memorable keepsake of an amazing night.